History: 25 year old female G5P0 presents for fetal anatomy scan at 19 weeks gestational age. 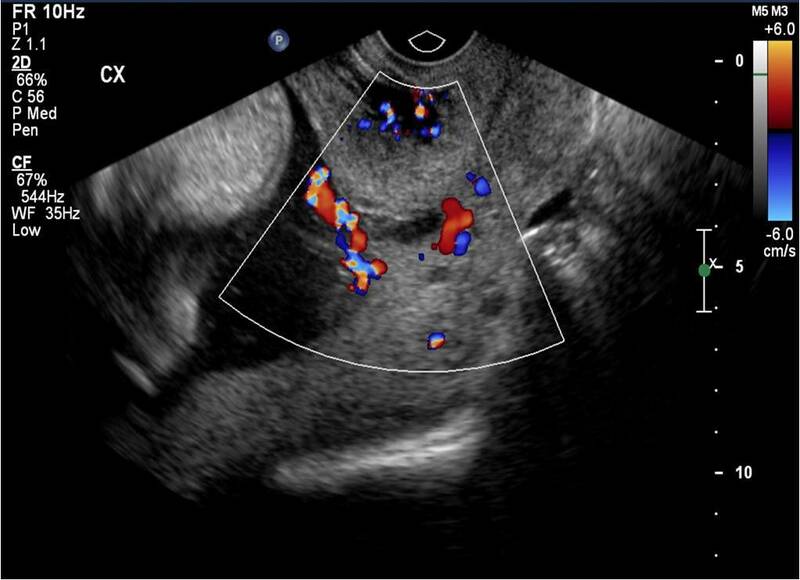 Vasa Previa: Sagittal ultrasound image through the cervix with color doppler flow shows velamentous cord insertion with the cord extending across the internal cervical os (vasa previa). This is the ultrasound appearance of vasa previa. Vasa previa is when the umbilical cord vessels course across the internal cervical os, putting the patient and baby at risk for hemorrhage during delivery. Vasa previa is seen independently of placental and cord anomalies, as well as in cases of membranous cord insertion and succenturiate lobe placenta, where the placenta is split into two lobes and crossing fetal vessels are near the cervix. If vasa previa goes undiagnosed, it results in 60-80% mortality. Fortunately this patient was diagnosed at 19 weeks, yielding a 97% survival rate.